Time again to reach back into the vault for a few one-offs that were fun, but for some reason didn't make it into a post of their own. The little rejected manis that could, as it were. 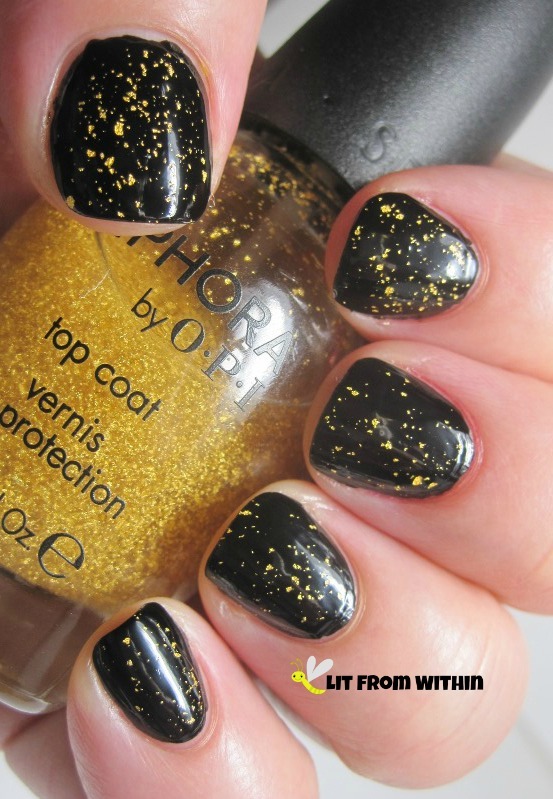 The chorus line manis. The bench-warmers. I've really sold them, haven't I? 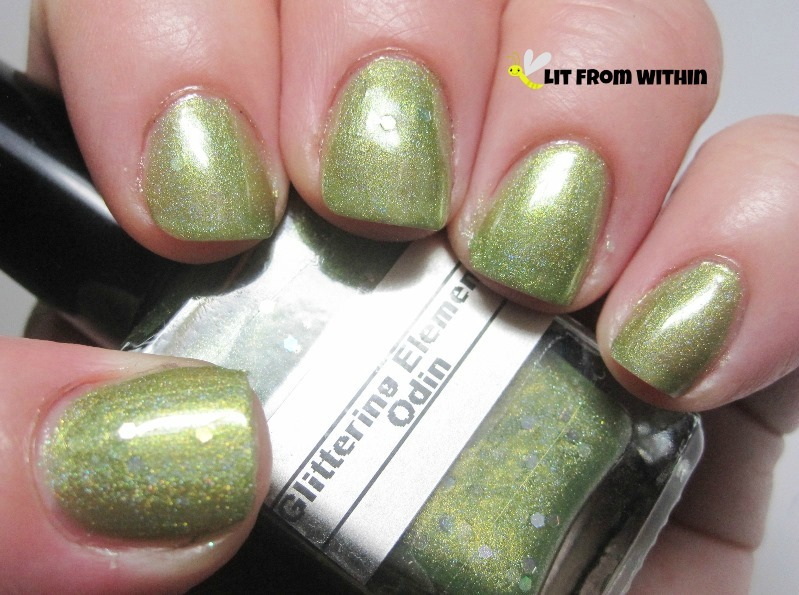 First up, Glittering Elements Odin, a metallic green with hidden holo hex glitters. I paired this with two glitter toppers from the LA.Girl Splatter line - Sputter (purple and white glitter in a clear base) and Sparkle (gold and white glitter in a clear base). Maybe I was going for a Mardi Gras theme? I went back and double checked the name of this polish, because it confuses me now as much as it did when I first used it. This is Aly's Dream Polish Dreamy Amethyst. Personally, I've only ever known Amethysts to be purple. This is not a failure of my camera - this polish is blue. Maybe a hint of purple flash. Nonetheless, it's a gorgeous blue! That cute little crescent moon stud and rhinestone is sitting on top of Colors by Llarowe Best Day Of My Life. 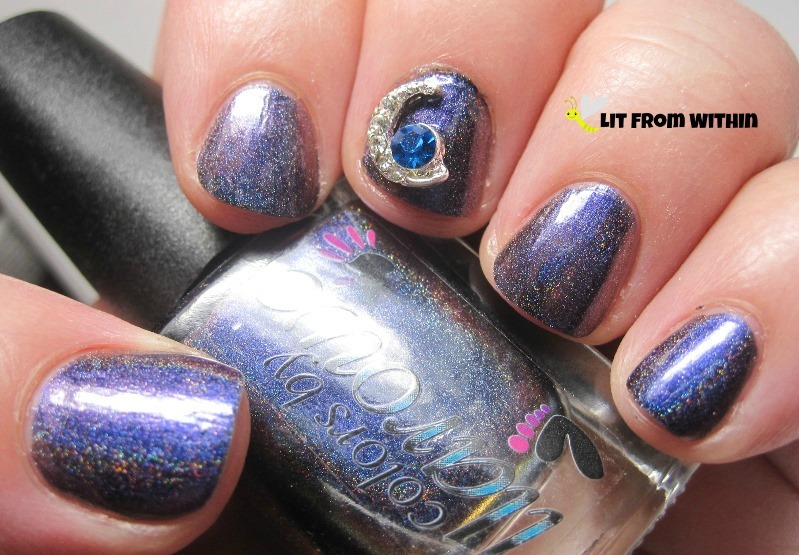 I've been really impressed with the pigmentation and rainbow flame of CbL holos! The formulas do tend to run a little thick, but usually not unwieldy. This is a really lovely royal purple with blue flash. And last, but not least, Jade Sunset. 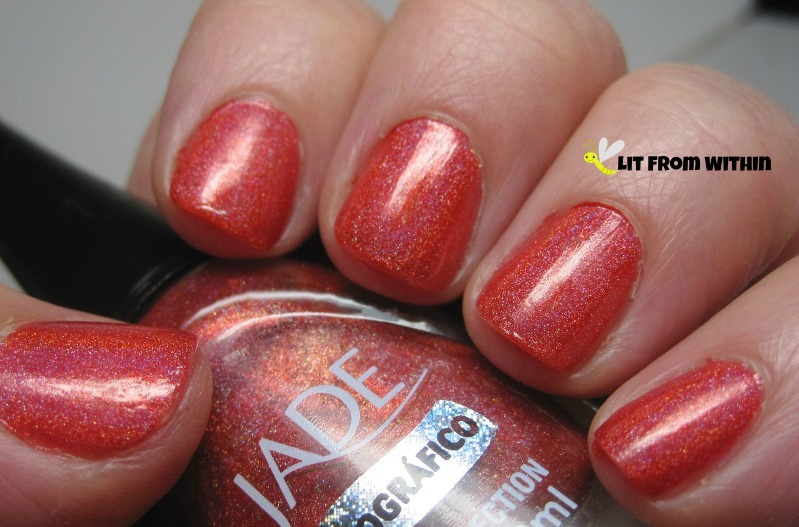 Still one of the best holo values, this little Brazilian brand packs a solid holo punch! I love this coral. So, there you have it, folks, the latest installment of 'Spam From The Vault.' Any favorites? It's Friday! What are you doing this weekend? 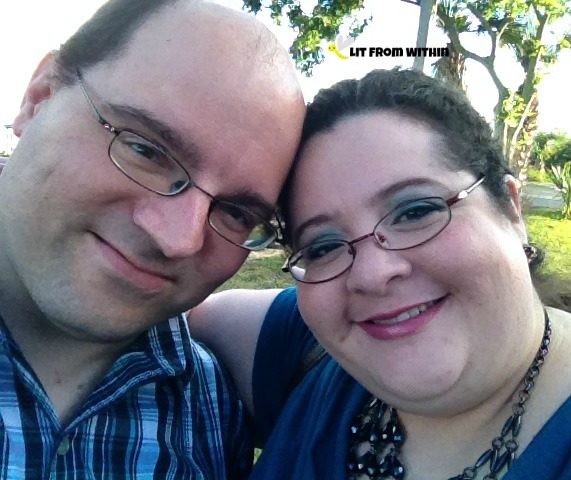 A little while ago, a friend dropped some community theatre tickets in my lap, so we got dolled up and went out! 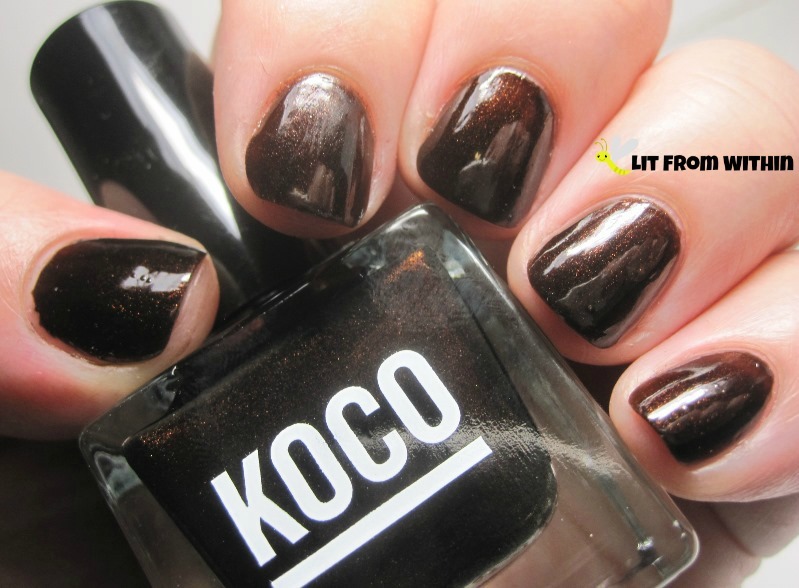 I was wearing this gorgeous shimmery brown polish from Koco called Insta-Glam. And, because when you go to the theatre, you should be dripping in jewels, I wore my real (simulated) crushed opal nail polish from Profound Glassworks! It's so subtle, though. I really wish the opals had more oomph. I was actually leaving the house, so painting *both* hands was in order. I wore some other jewels, too. 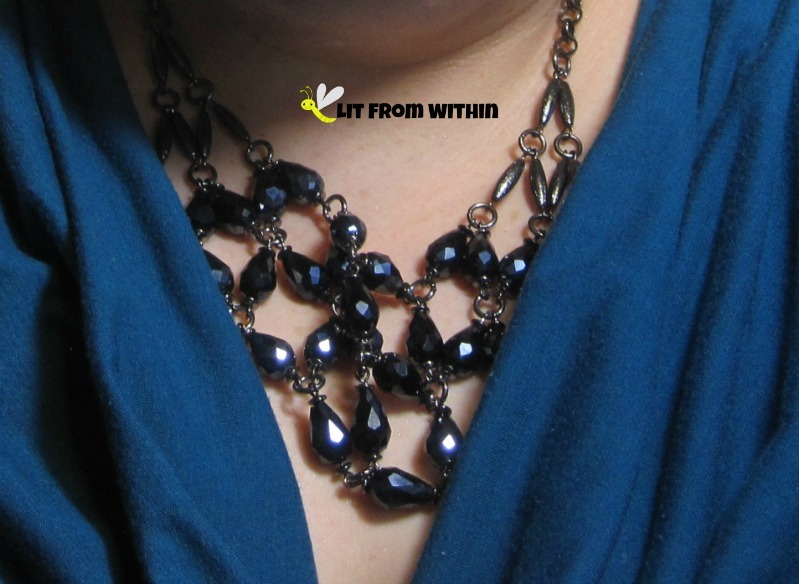 I don't normally wear these bib-style necklaces, but I love this. Found it on clearance at Target. I have been experimenting more with my makeup, and figured - what better time to go for a dramatic eye than when I'm going to the theatre? If anyone understands bold makeup, it's them! I used my ELF brow kit (still learning!) and L'Oreal Color Riche Eyeshadow palette in 211 Blue Haute Couture, and Rimmel Scandal Eyes Mascara. 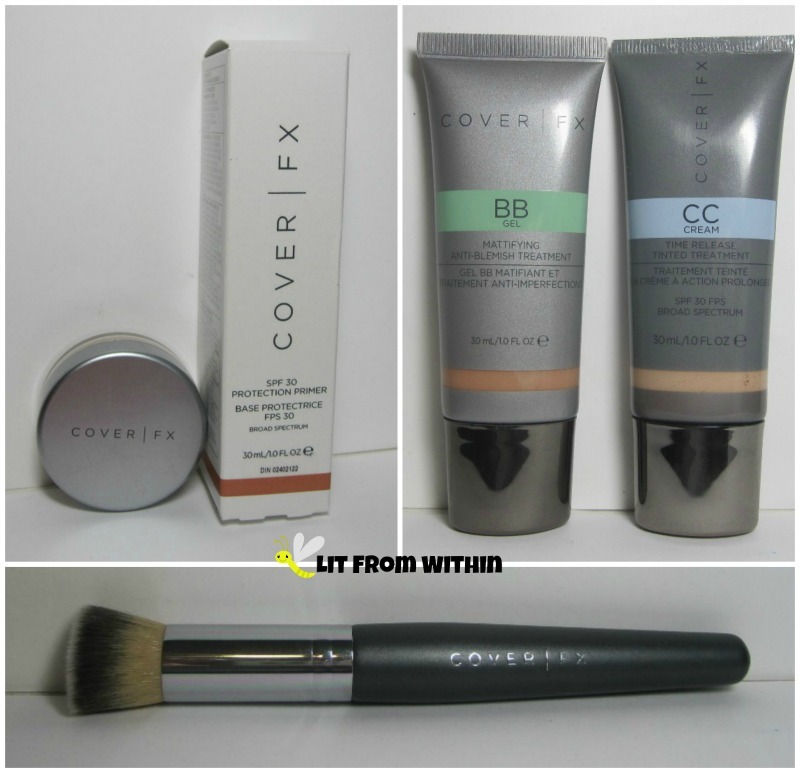 My primer and foundation were my new go-to products from Cover FX - the matte primer and the BB Gel. I think I used my Hourglass Mood Finishing powder that night, too. 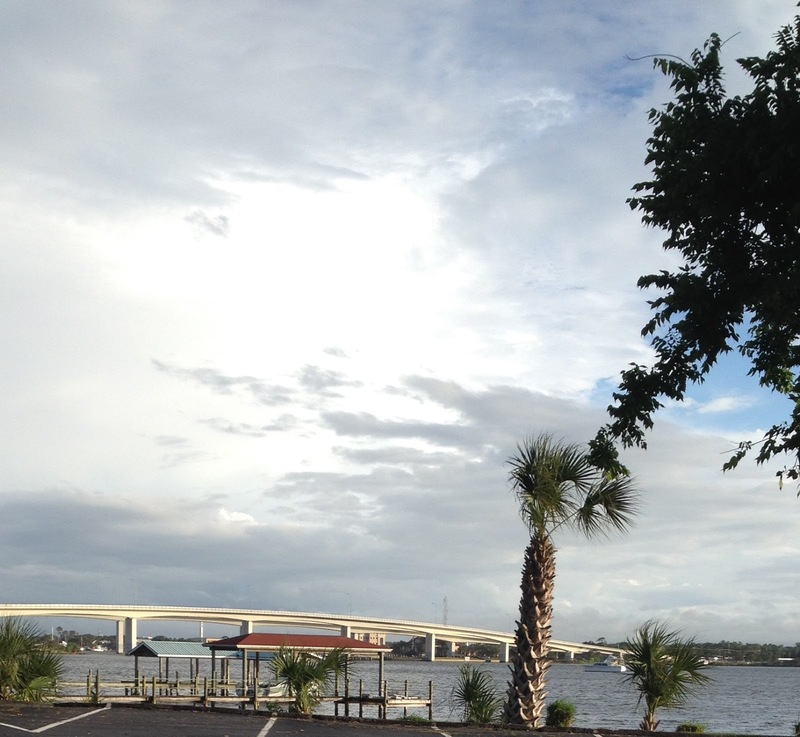 The playhouse was right on the Intercoastal waterway, by the bridge. I love where I live. My Cover FX primer and BB Gel held up admirably in the Florida heat. Hubby could have maybe used some powder for his shiny head, though! 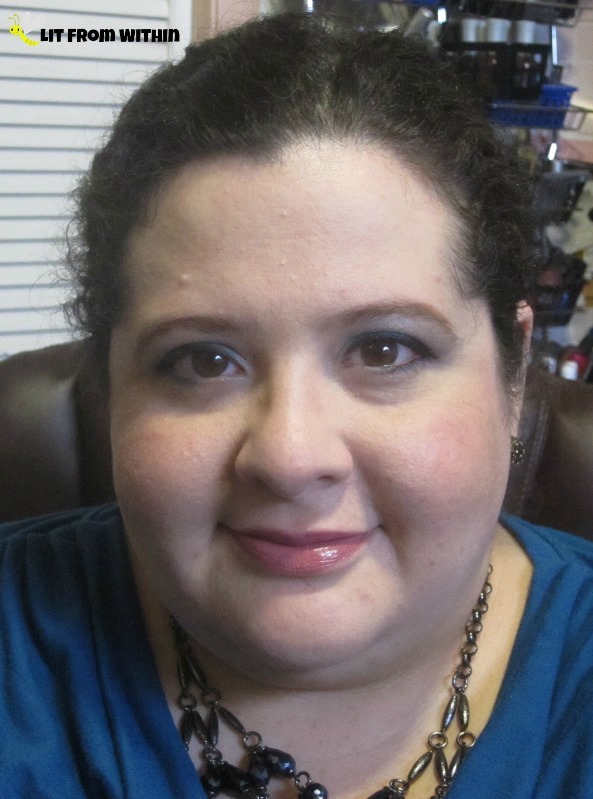 Usually, I wear a bold lip when I want to feel glam, but this time, I went for bold eyes. What is your go-to for feeling instantly glam? I'm sorry I missed last week's "With Bling" challenge. I added a little bling to this one, hope you like it! 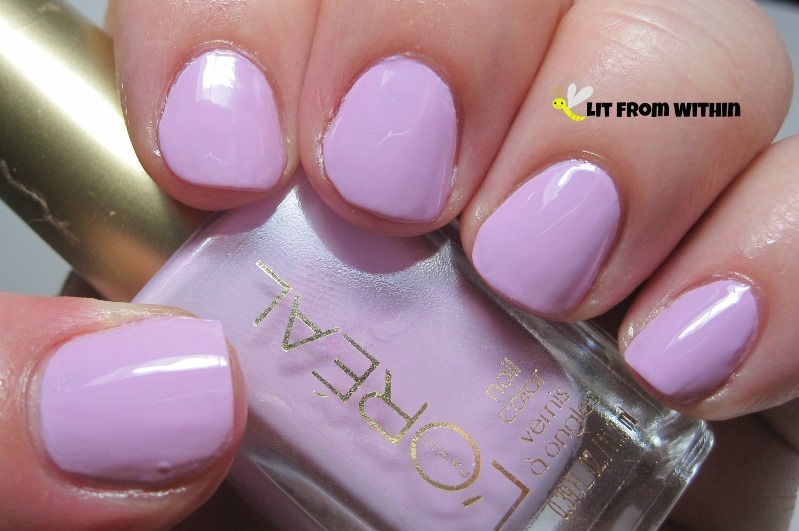 This challenge is 'Lilac", and while I'm a little fuzzy on all the different permutations of purple, this polish from L'Oreal is called, "Lacey Lilac," so I'm pretty sure I'm in the ballpark. I was feeling a 50's retro-vibe with this dotticure! Like I should be wearing a poodle skirt and going to a sock hop. Let's take the cute factor up a notch. Bows! Tiny iridescent glittery bows, and one GIANT Blingy bow. Is there anything more girly? Bottle shot: L'Oreal Lacey Lilac, and Revlon Spirit. Aside from the giant bow, I would totally wear this. 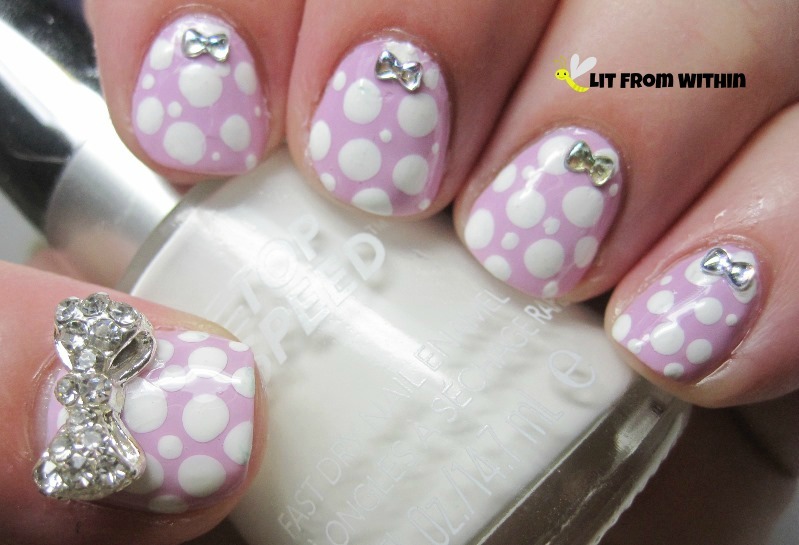 How do you feel about ultra-girly nail art? 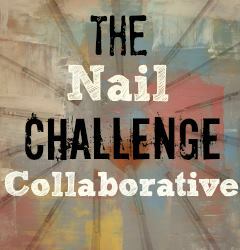 Also shared on The Nail Files! 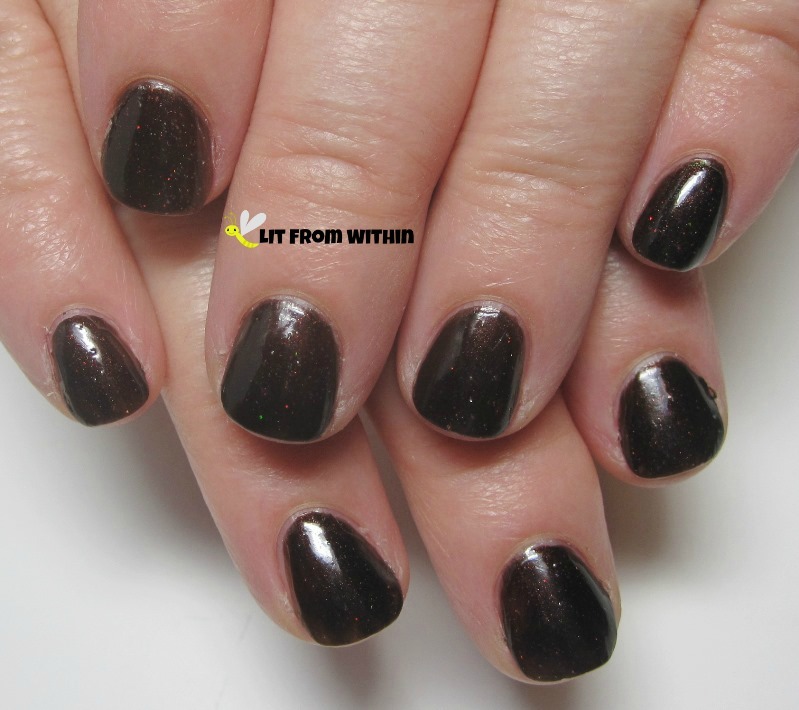 Please click through to see other manis. What Does The Fox (Holo Skittle) Say? This is the last NCC skittle challenge this month! 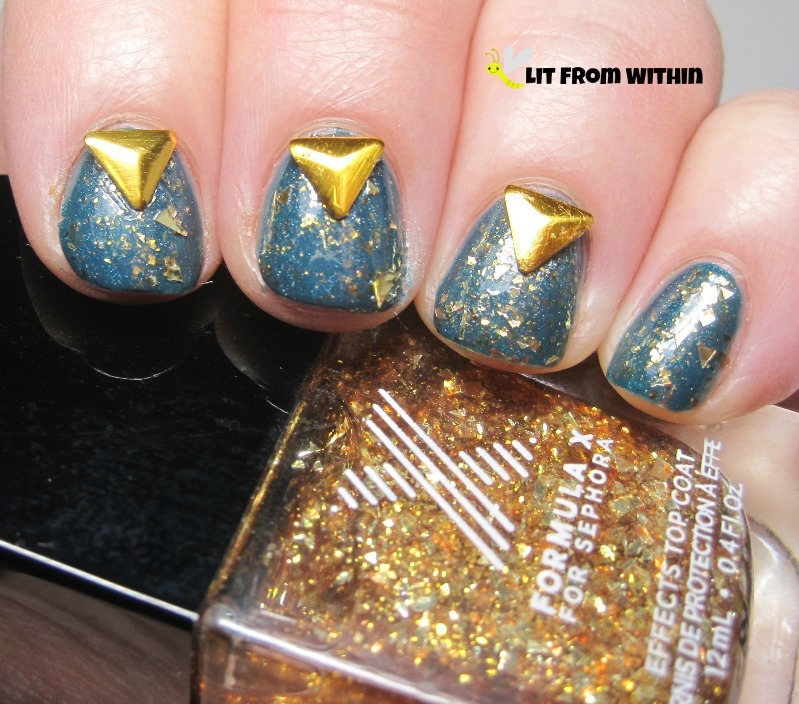 This isn't a nail art I gravitate to, so it was fun to think of different ways to wear it. Challenges definitely help keep me from doing the same old, same old.. So, this skittle was inspired by the colors in the nail decoration I decided to use for this look: pink and blue. 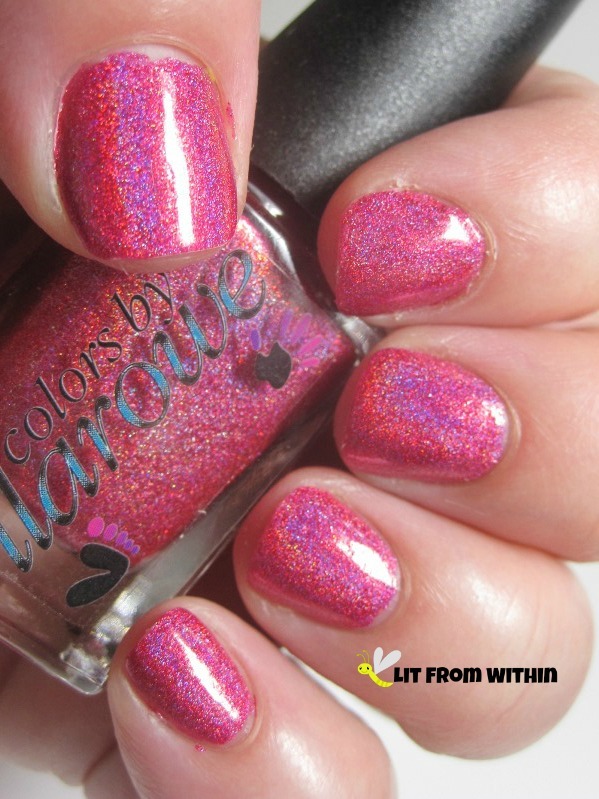 The pink (an awesome freebie sent with an order I placed) is Nail Nation 3000 Inner Flame, a hot pink holo. 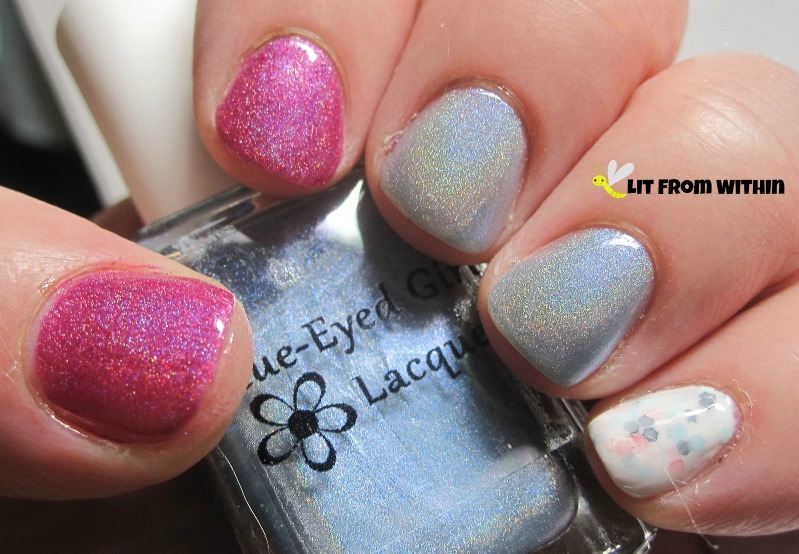 The blue is Blue-Eyed Girl Lacquer Tea Is Soothing, I Wish To Be Tense, a light blue holo from her Buffy The Vampire Slayer-inspired collection. The glitter is Funfetti from (apparently defunct) Makeup Your Face. 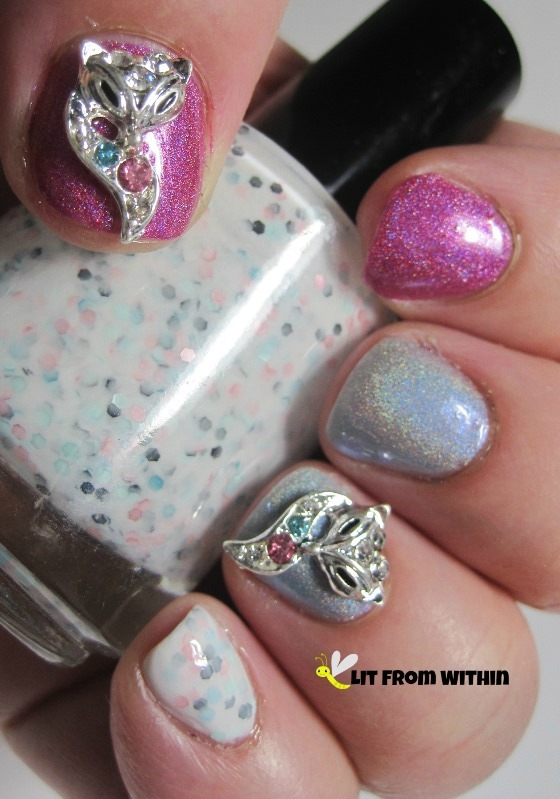 And, my inspiration, a little fox nail decoration, with pink and blue stones in the tail! Let's all say it together, now: AWWWWWWWWW. Double the foxes, double the cute! If you love nail decorations, Ebay is the place to go. The cheapest prices are from sellers in China, but they can take quite a while to ship to the USA. Your Mileage May Vary. 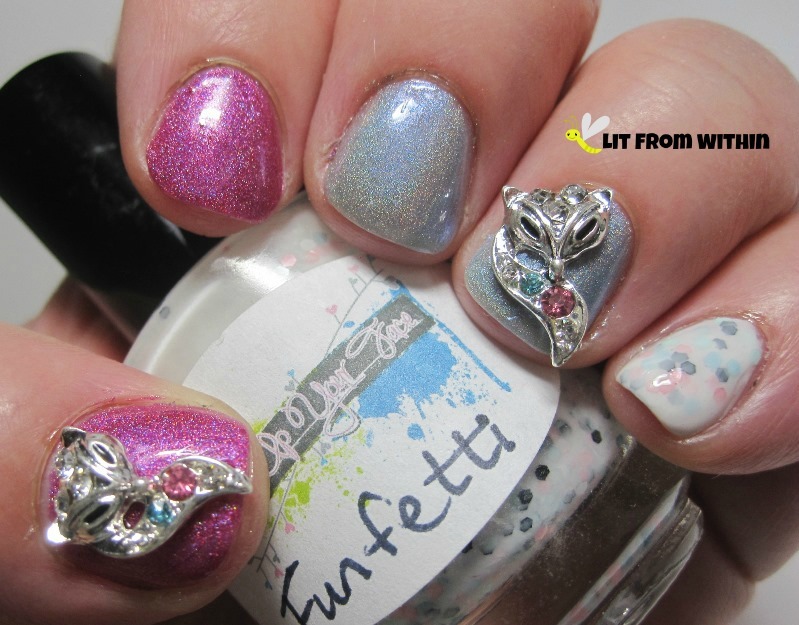 I love how Funfetti's glitters compliment the blue and pink holos, but stay soft because of the milky base. I admit, most times after I take the pix, the nail decorations come right off, because otherwise I'll just pick them off. 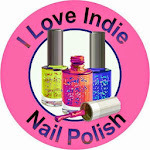 But I dearly love sticking things on my nails! 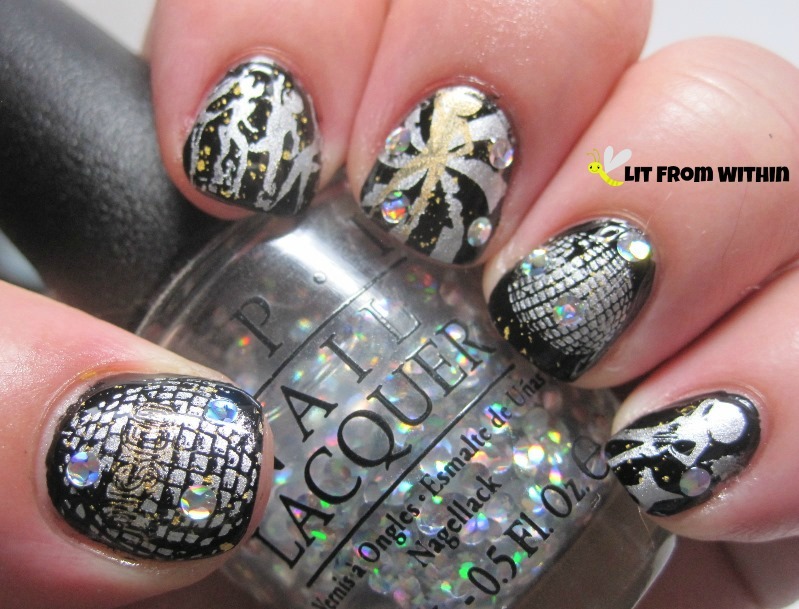 How do you feel about nail decorations? 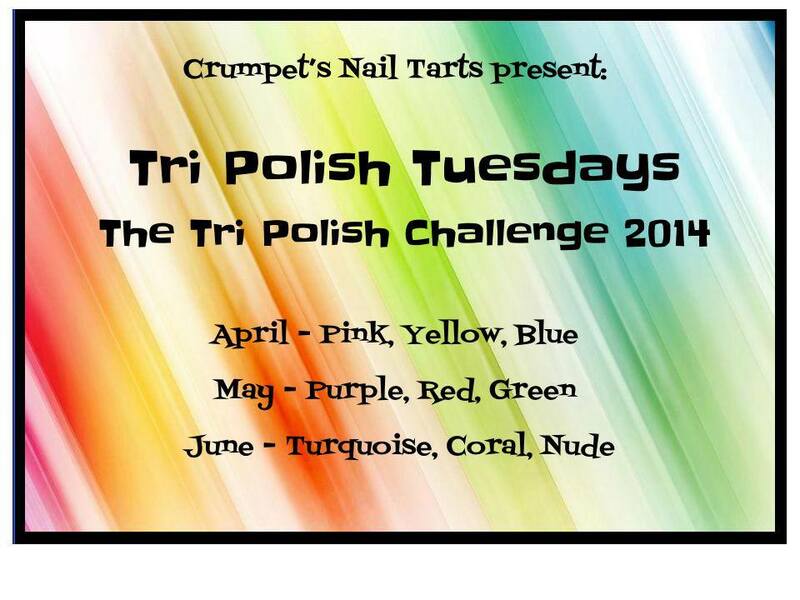 I was doing the Challenge Your Nail Art monthly challenge last week, and ignored my Crumpet Nail Tarts challenges! 30 lashes with a wet noodle for me! 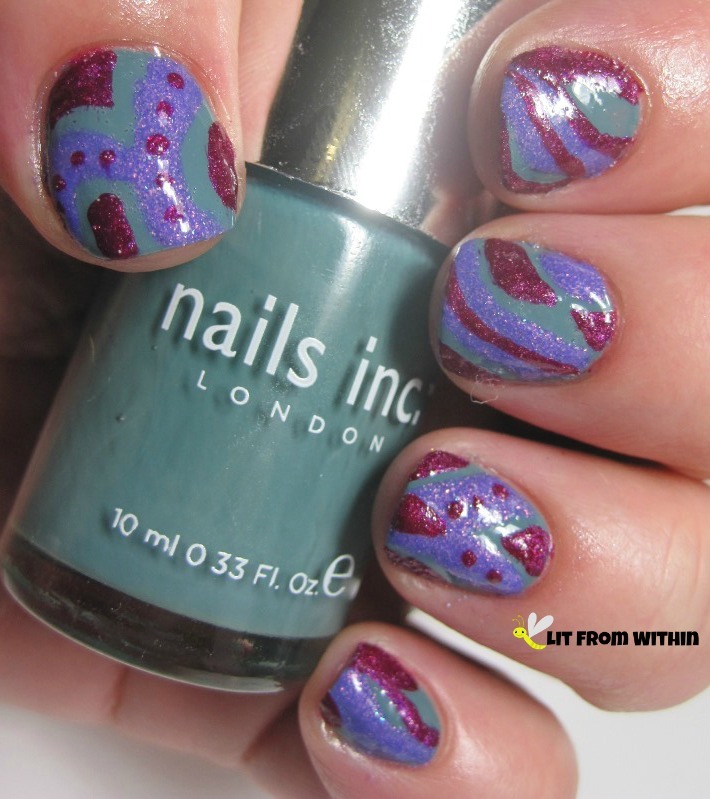 But, I'm back, with a funky mani inspired by Finger Food's technicolor abstract nail art. 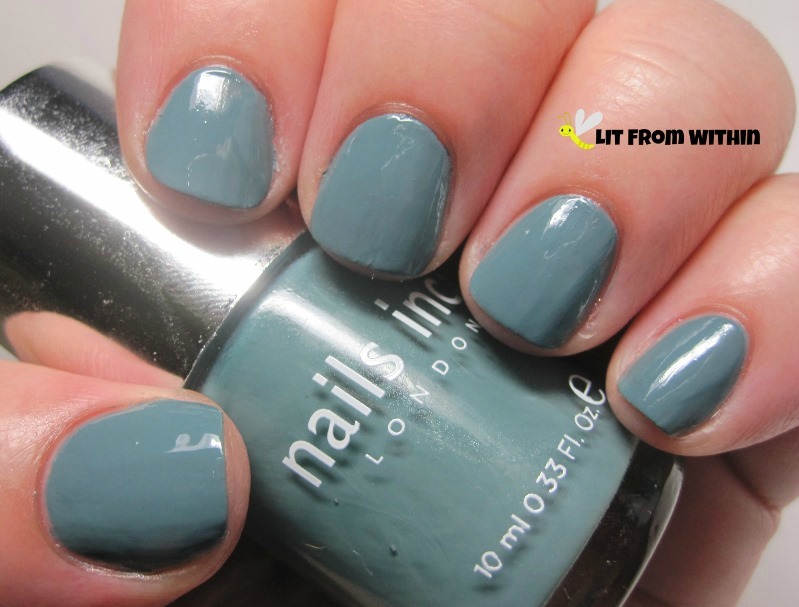 I started with Nails Inc Green Park, a dusty greyed-green. It's not as far as Army green, but it's not a clear garden green. These greyed-out colors are some of my very favorite polishes. So sophisticated! For the purple and red, I go crazy for the textures! 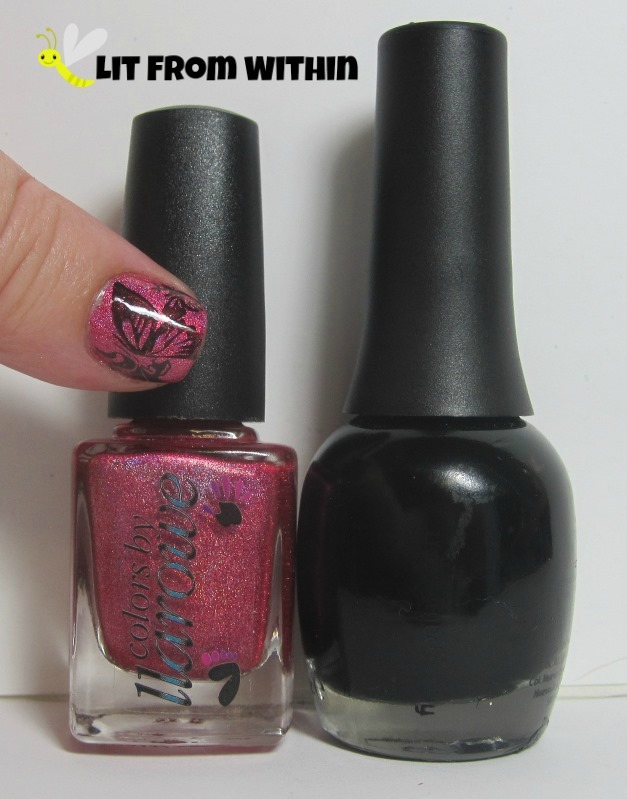 I love the ones with some sparkle to them, and Sinful Colors Purple Gleam has a nice, soft shimmer. 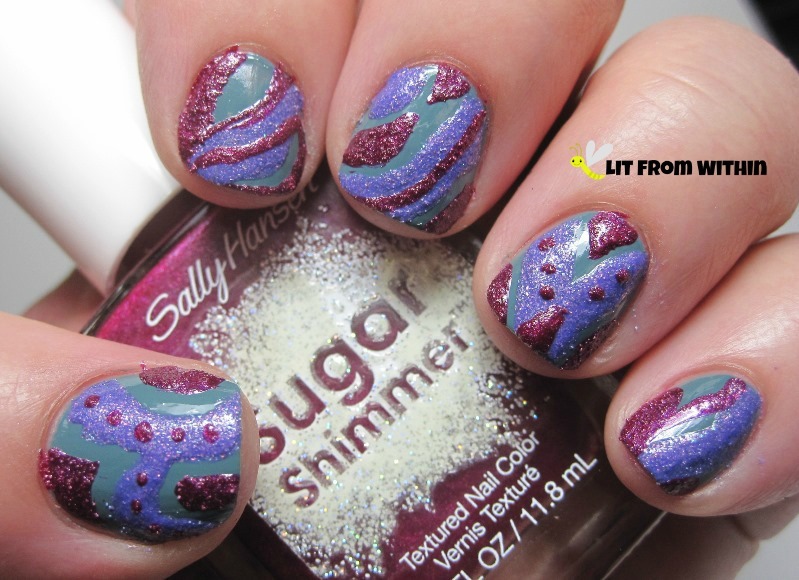 Sally Hansen Sugar Shimmer Cinny Sweet brings even more sparkle, and it's thick enough to draw dots and lines and be opaque. This is so fun.. but I knew I couldn't leave it all bumpy. I'd be too distracted by all the different levels of polish. It's not as unique all topcoated, but it's still pretty. And, there's still some sparkle! 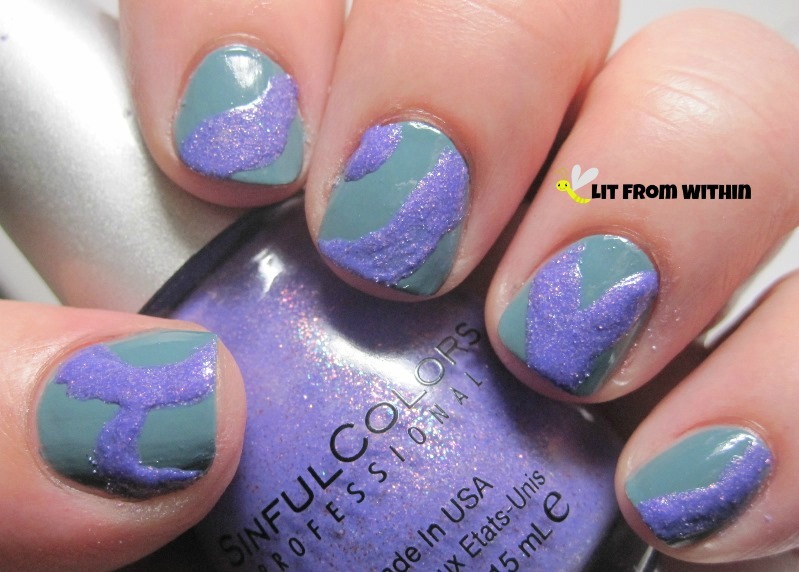 Bottle shot: Nails Inc Green Park, Sinful Colors Purple Gleam, and Sally Hansen Sugar Shimmer Cinny Sweet. I really like the versatility of textures, though I know not everyone likes them. 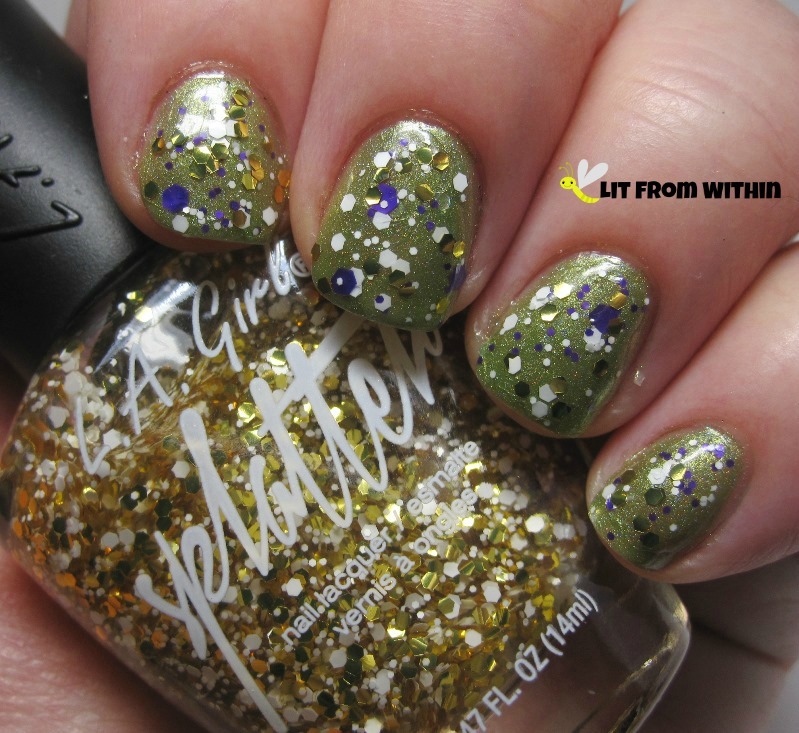 With a bit of topcoat, they look like sparkly glitters or shimmer polishes, so I know I'll use them for years to come, even when the trend is done. Is it an oxymoron to say Happy Memorial Day? At any rate, I wish peace to those of you who have lost loved ones in service to their country. 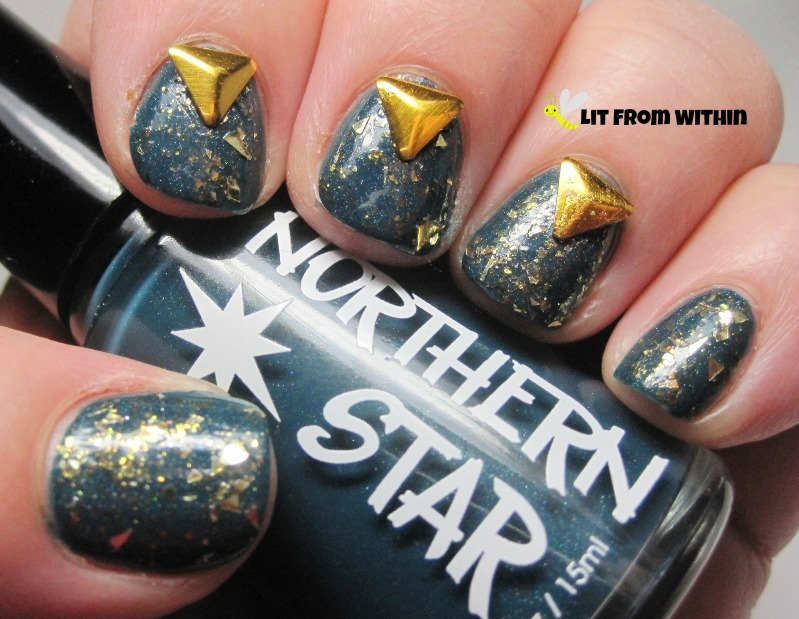 I already did a 'Memorial Day' mani last week, but I thought that this mani from the vault was appropriate. I'm sorry I didn't take pictures of the build up. I don't know what happened. 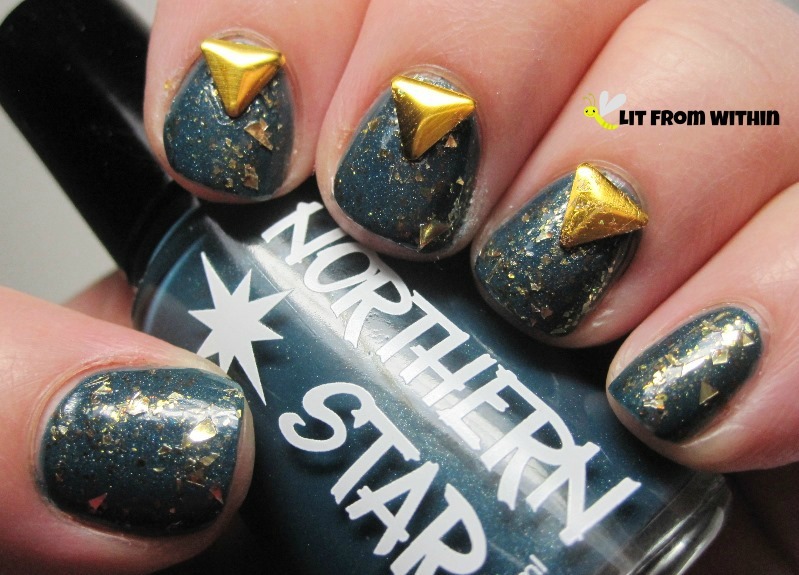 This is Northern Star Polish Peacock Party with Sephora Formula X Out Of Sight, and a few gold triangle studs. Isn't that deep teal gorgeous? It does have a subtle holo to it, but it kinda got lost in the gold. I love how this gold topper is part glitter shards and has a flakie quality to it. Rather than sitting on top of the polish like a glitter topcoat, it seems to meld with the polish. And you know I love to stick things on my nails, even if they come right off after I've taken the picture! 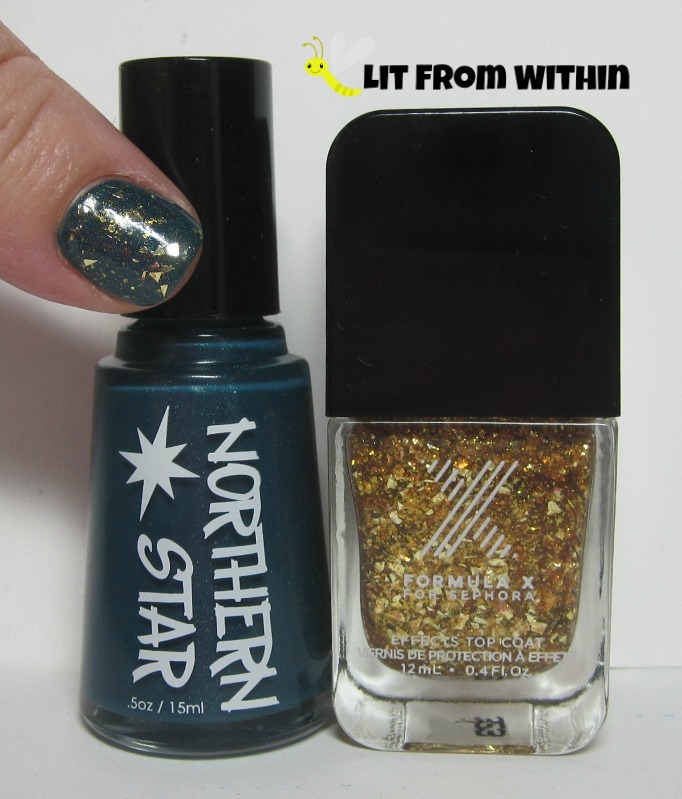 Bottle shot: Northern Star Polish Peacock Party with Sephora Formula X Out Of Sight. Has this weekend meant anything different for you? Hubby's had a 4-day holiday weekend, so we've been spending a lot of quality time together and doing some house projects. I hope everyone has a few moments to spend with loved ones, even if only in thought or prayer. Two posts today! I have an EPIC, MEGA Cover FX product review post today. Click here to check it out. If you read my post about Phyrra's Cover FX Find Your Shade event, you may already know that I'm a new fan of Cover FX! At the event, I was given their SPF 30 protection primer, and their setting powder in medium. I was also sent their CC cream in P-light/medium. I purchased the BB Gel in P-light medium, and the liquid foundation brush on my own. I can't wait to show you all of these awesome things! 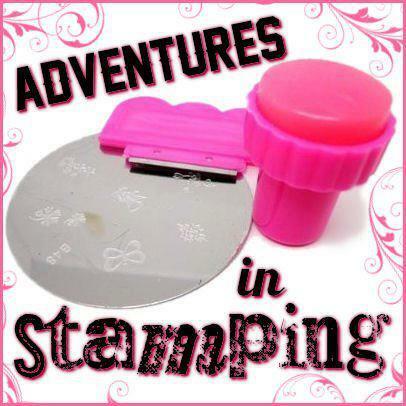 Today's Sunday Stamping challenge is butterflies, ladybugs, or fireflies. I totally need a firefly stamp!! Does anyone know where to find one? 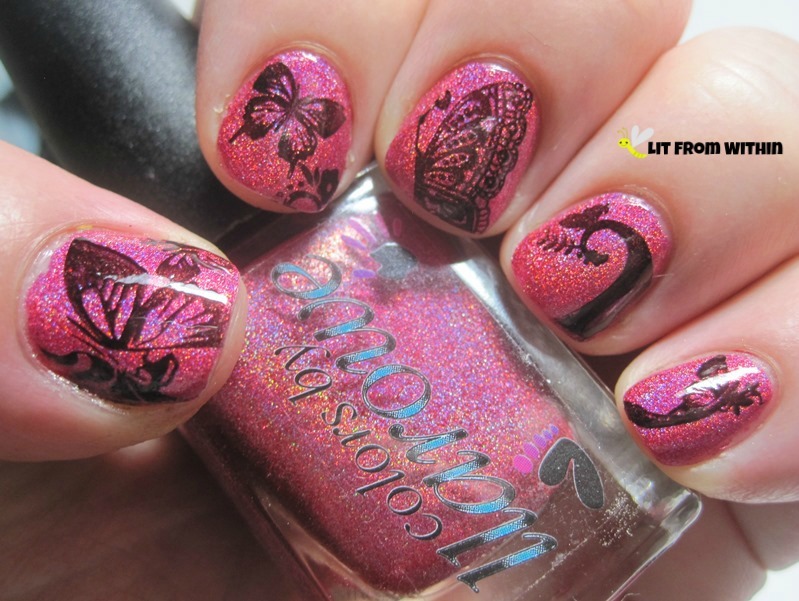 I thought it would be funny to stamp butterflies over a polish named "Bea Stings." Bee stings. Get it? I knew you would. 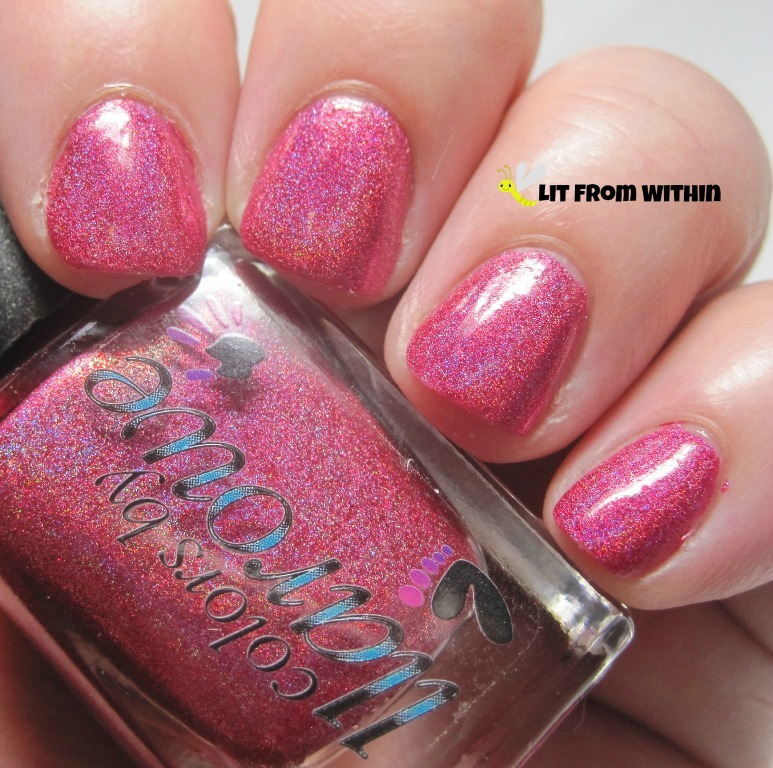 Bad puns aside, it is a gorgeous hot pink holo, that flashed orange at times. This was so distracting when I was driving around today! I would see red and purple and orange in the rainbows. 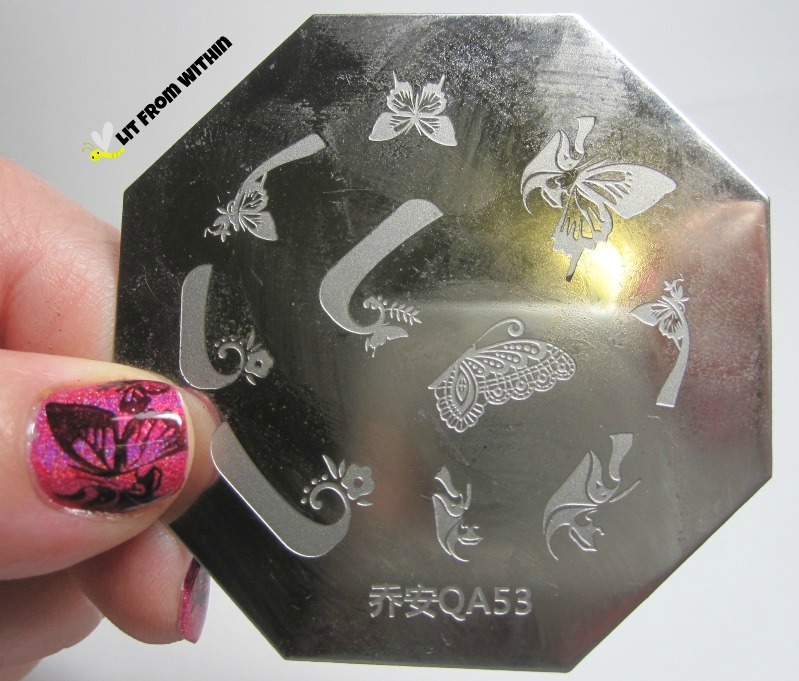 I bought plate QA53 from Born Pretty Store during one of their sales. I was pleasantly surprised at how easy this plate worked. It's been a while since I had a plate that worked perfectly for every image. I wasn't sure about using plain old black (Finger Paints Black Expressionism) to stamp such beautiful butterflies, but I love how it looks over that crazy, bright, stunning holo. 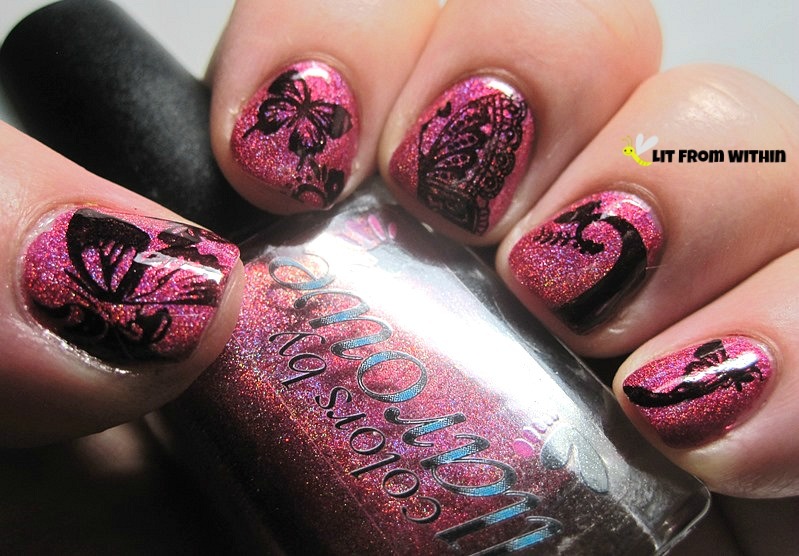 That lace pattern on the middle finger butterfly is sweet. I changed the angle of the light for this pix, trying to bring out more of the rainbow colors. Can you see the purple and orange? Bottle shot: Colors by Llarowe Bea Stings, and Finger Paints Black Expressionism. It's not a complicated nail art, but I love it.. and I love bad jokes, too! If you have a favorite bad joke, I'd love for you to share it in the comments! Here we are, Fireflies! 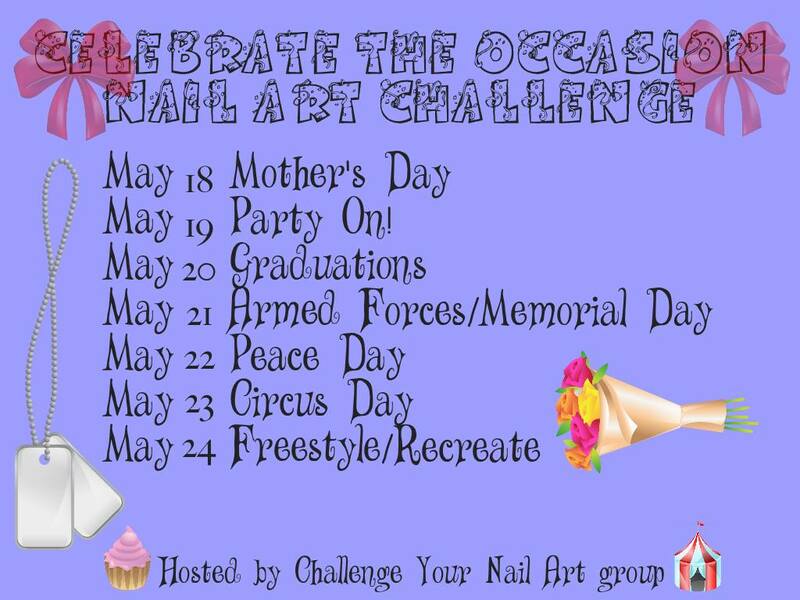 The last day of the Celebrate the Occasion with the Challenge Your Nail Art group. This has been fun for me, and I've definitely had to give some thought to these special occasion nail arts. 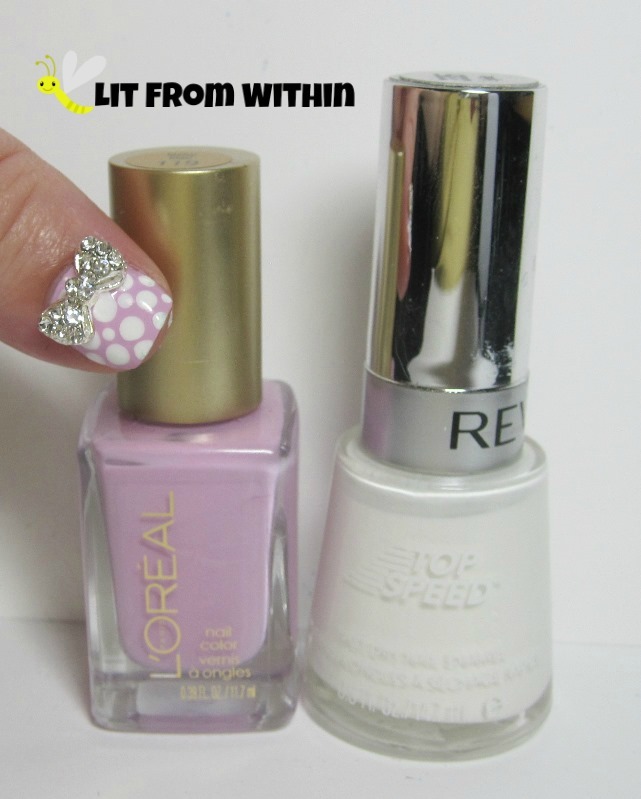 For my freestyle mani, I decided to do a Dance Party! 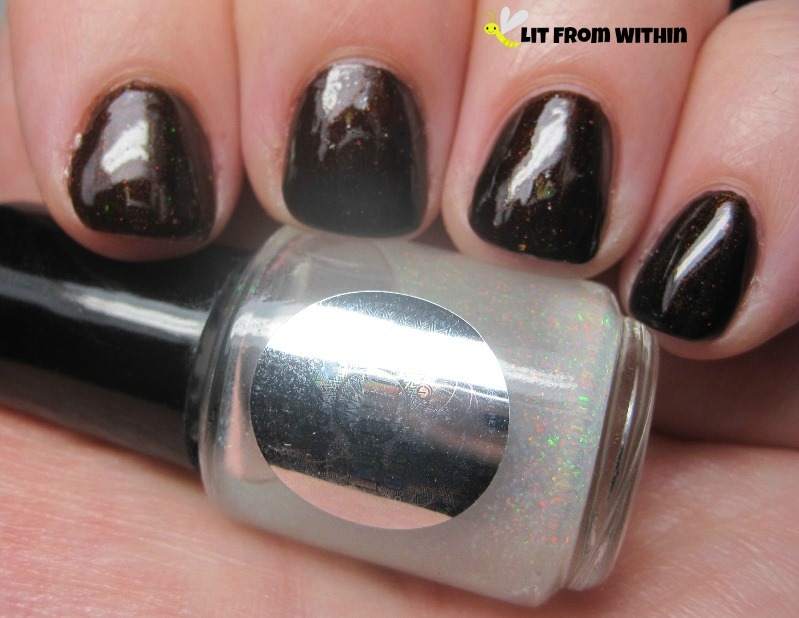 So, my dancefloor is Wet 'n Wild Black Creme with a smattering of Sephora by OPI 18k gold topcoat. Reading '70's excess already! 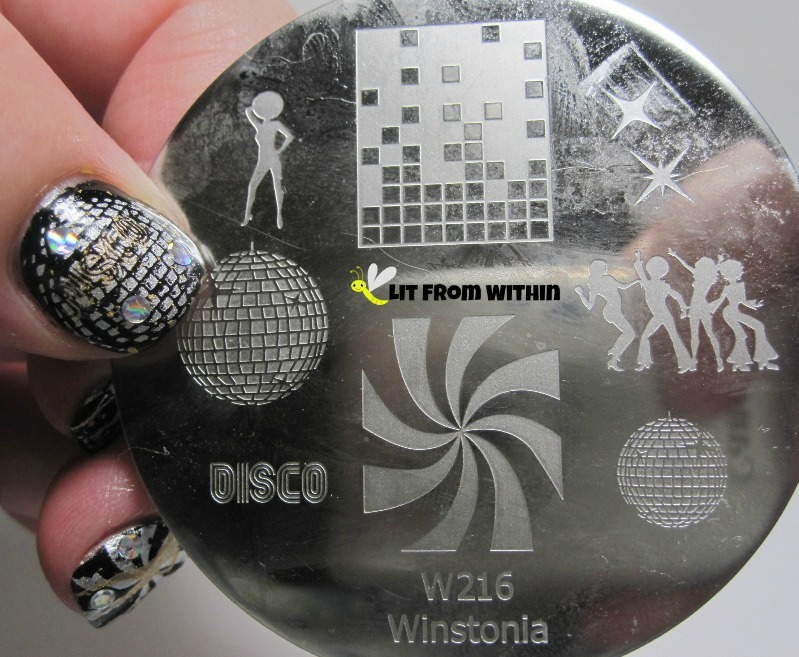 Check out this groovy stamping plate by Winstonia! Bell-bottoms, big hair, and disco balls! 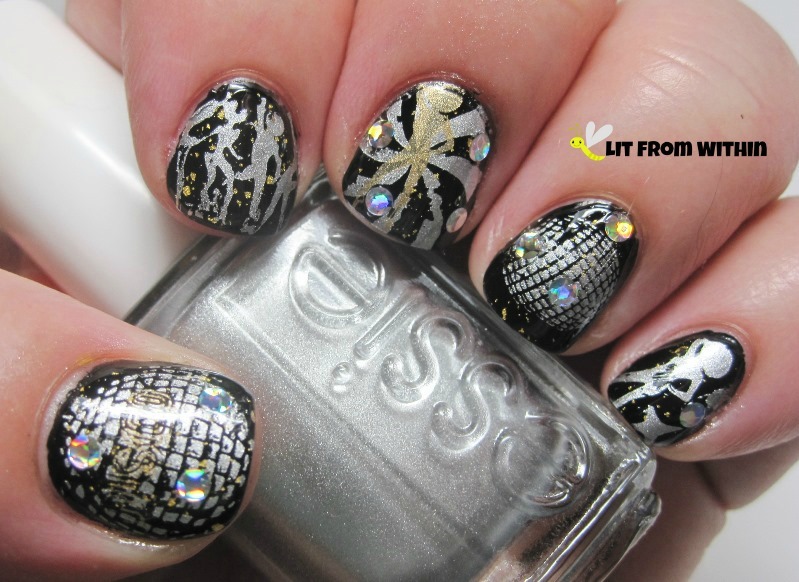 I used W216 and Essie No Place Like Chrome, as well as Maybelline Bold Gold for the stamping. 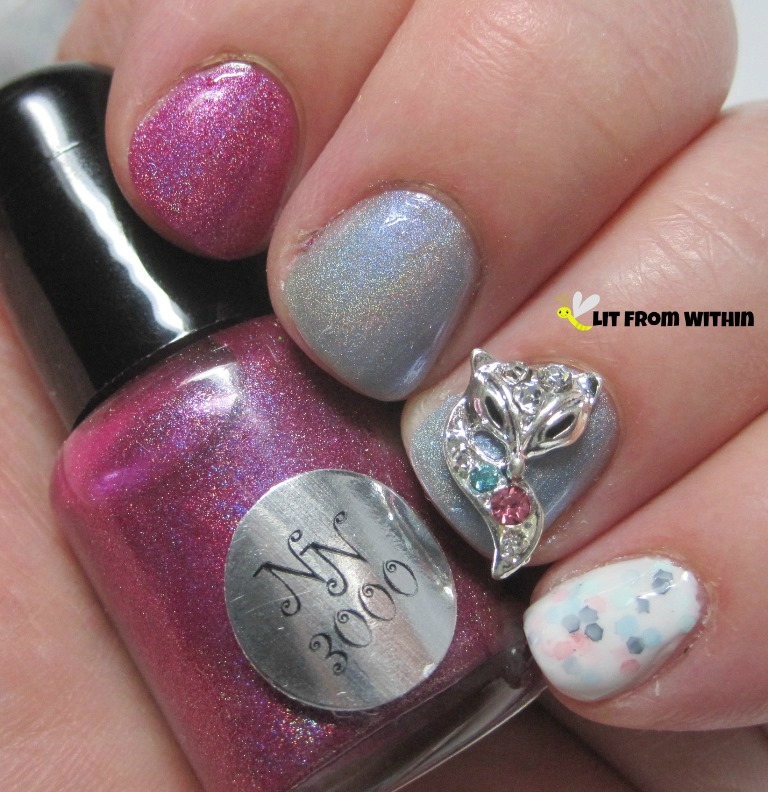 I couldn't resist pulling some of the holo circle glitters out of OPI I Snow You Love Me for a little extra bling-bling! It's a Studio 54 Discotheque Glitz and Glam Sparkly, Gold Lame' Dance Party! All that's missing is the coke! 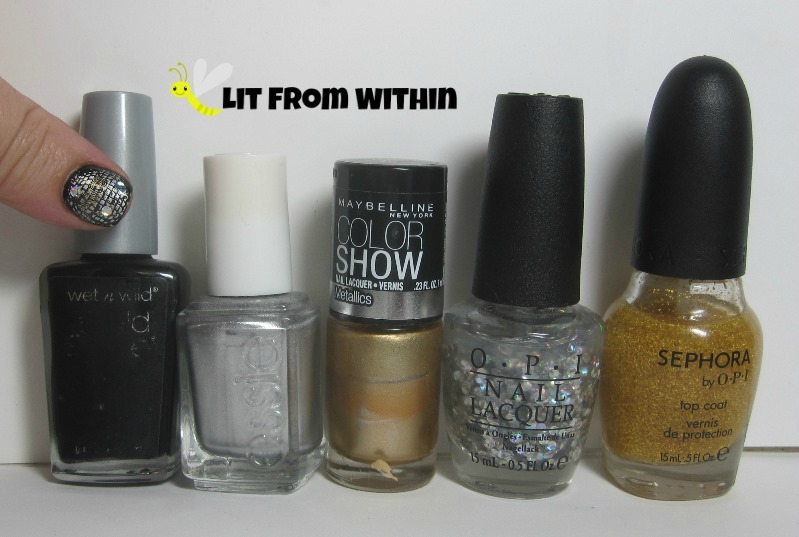 Bottle shot: Wet 'n Wild Black Creme, Essie No Place Like Chrome, Maybelline Bold Gold, OPI I Snow You Love Me, and Sephora by OPI 18k gold topcoat. Saturday Holo Spam - Indie Purple Edition! Want to Try a New Look? Find One On Glam St!